When the surgery is closed, please telephone 111 (i.e. the NHS emergency and urgent care service). 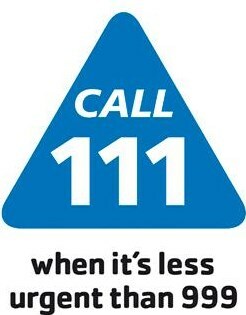 NHS 111 is available 24 hours a day, 365 days a year. Calls are free from landlines and mobile phones. The NHS 111 service is staffed by a team of fully trained advisers, supported by experienced nurses and paramedics. They will ask questions to assess your symptoms, then give you the healthcare advice you need or direct you straightaway to the local service that can help you best. That could be an out-of-hours doctor, an urgent care centre or a walk-in centre, a community nurse, an emergency dentist, a late-opening chemist or A&E. Further information on local walk-in centres can be found here.